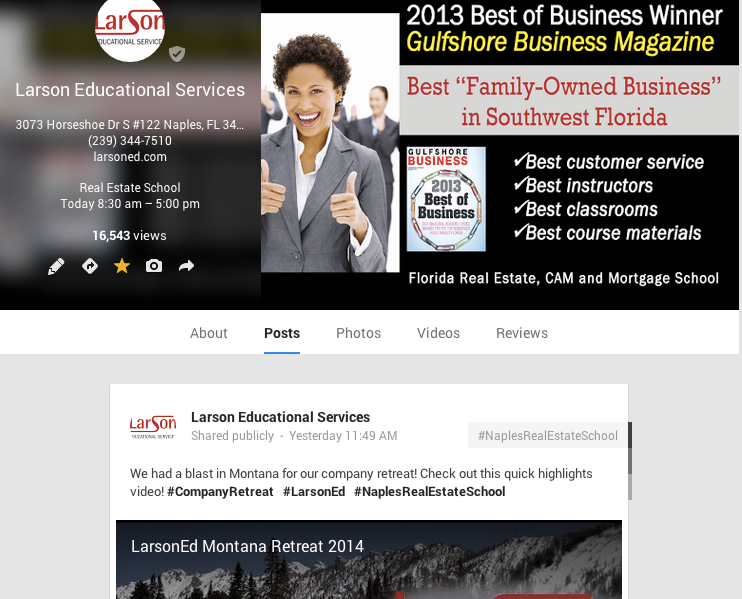 Naples real estate school Larson Educational Services is expanding its social media reach with a brand new Google+ page. Follow the page for updates on course schedules, real estate career nights, our latest videos, and our bi-weekly press releases. If you aren’t on Google+, what are you waiting for?! Consider this: According to BusinessInsider.com, it took Google+ 1 month to get to 25 million users. It also became the second biggest social network in the world last year. How long did it take Facebook, the world’s number one social network, to get that many users? 3 years. Google+ is the fastest growing social media site in the world and it’s a great way to connect with the people, businesses, and industries you care about. We are just one of the many entities with whom you can connect on the ever-expanding network. Make LarsonEd’s Naples location one of your first connections on the site. Or, if you are already on Google+, add us to your already established list of companies you follow. Our Naples school is just 5 minutes from I-75 and offers the same dynamic instruction, comfortable classrooms, and superior educational experience that you get from our Fort Myers location. If you’re a past or current student and have enjoyed your LarsonEd experience, be sure to give us a review on the Google+ page and connect with us. The reviews will really help us reach more students like yourself and get them passing the Florida real estate exam. Don’t forget to add my personal page to your circles as well: Brad’s Google+ page. We look forward to connecting with you on Google+. And if you have any questions or want to register for class, call us at 239-344-7510 or visit our website at http://www.LarsonEd.com/realestate/licensing/naples-real-estate-school/. Have you just received your Florida real estate license? Now it’s time to get your real estate business up-and-running (or, if you don’t have a license but would like to get one, watch our “How to get a Florida real estate license” video here: https://www.youtube.com/watch?v=RNP43vvUudY). Larson Educational Services recommends completing the 45 hour Sales Associate Post-Licensing Course within 3 months after you obtain your license. Why? Because in this course, designed by the pros at Larson for SWFL sales associates, you’ll learn practical information regarding today’s real estate business. Through lively discussions and hands-on workshops, you will build the foundation necessary to get your real estate business off to a fast start. This is not a “sit back and listen” type of course. You’ll interact, discuss, and plan as we walk you through all the most important aspects of the real estate industry. –Prospecting and Pricing Listings that Sell! Complete your requirement in 2 dayS! You can register for your 2012 CAM Continuing Education course through Larson Educational Services right now without any payment and lock in your registration! Just pick a date below to attend and click the “Register Now” link or give us a call at (239) 344-7510. We’ll put you on the course roster and you don’t need to pay until the day you come to class. Note: We can accept “unpaid registrations” through our online system or over the phone if you’d like to hold your seat. Just click “Register Now” for a date below or call us at (239) 344-7510. Do all Florida Community Association Manager licensees need to complete continuing education? Yes, however, there is an exemption for those who received their CAM license between October 1, 2010 and September 30, 2012. If licensed between this period, you DO NOT have to complete continuing education, but you WILL need to renew the license and pay the license renewal fee. What topics are covered in the 20 Hours of continuing education? Can I take the CE courses at Larson Educational Services even if I don’t need the CE credit? Absolutely! Our CAM CE courses are designed with the working CAM professional in mind. They are relevant to the current marketplace and are taught by experts in the industry. What if I completed some continuing education courses in 2011, but I know I still need to do some more? How much does it cost to renew my Florida CAM license? The renewal fee is $105 and is paid at the time of renewal. When is the deadline to submit my renewal? All Florida Community Association Managers must submit for renewal no later than September 30, 2012. Do I need to complete 20 Hours of Continuing Education before I submit my renewal? Yes. The DBPR requires that you complete your 20 Hours of Continuing Education prior to submitting for renewal. Can I take a 20 Hour Continuing Education class in September and still renew my license by September 30, 2012? Yes. When you take a class with Larson Educational Services, we upload your completed hours of education to the DBPR system at the conclusion of the course. Within 48 hours of your completed class, you can renew your license through the DBPR. CLICK HERE to view more renewal requirements and other FAQs.